Mark Twain by artist Francis Millet. Over 800 miles separates two portraits. One lies out of sight at the Mark Twain Birthplace, near Florida, Missouri, property of the State of Missouri. The other hangs in a morgue-like vault belonging to the Harry Ransom Humanities Research Center at the University of Texas in Austin. Both are portraits of the same man with short hair, baggy jowls, and sagging ear lobes. Both portraits are the same size, approximately 15 3/4"(W) x 19 3/4"(H), same pose, and sport the same signature by an artist in the upper right hand corner -- F. D. Millet. The artist did not date either portrait. The State of Missouri made their purchase in 1950 believing they were buying a portrait of Samuel Clemens painted in 1876 by Francis Davis Millet. Harry Ransom did the same and the portrait in Texas has a metal plate attached to its frame proclaiming that date. Neither portrait depicts Samuel Clemens at the age of forty-one in 1876. The undisputed portrait of Samuel Clemens by Francis Davis Millet, canvas measuring approximately 29"(W) x 35 1/2"(H), currently hangs above a fireplace in the Hannibal Free Public Library in Hannibal, Missouri. It was a gift to the Library from Clara Clemens Gabrilowitsch in 1911, less than a year after her father died. The minutes of the Library's Board of Directors of February 7, 1911, acknowledge the donation of the portrait. The portrait features a vibrant Sam Clemens looking straight ahead and is signed by Millet and dated in the lower left corner. It was this way," he explained, "when I started sitting for that one, my hair was fairly long, but as the sittings continued, it grew until it was uncomfortable. So one day, without saying anything to Millet about it, I went to the barber to have it trimmed. Unfortunately, I grew sleepy in the comfortable chair, and when I woke up I saw that I had lost all likeness to my portrait. I didn't know what to do, for I was afraid of Millet in those days, so on the day for the next sitting I hired a wig and went to the studio. When I got there Millet at once noticed how fine my hair looked and painted it, and it wasn't until the session was ended that I took it off (1). When I joined Millet he took one glance, realized the disaster that had befallen, and said he wanted to go to some private place and cry. He devoted a couple of diligent weeks to the portrait and made a good one, if you don't count the hair, but as there was no hair, he had to manufacture it, and his effort was a failure. I have the portrait yet, but the hair it wears is not hair at all; it is tarred oakum, and doesn't harmonize with the rest of the structure (2). The haircut story provided a basis for a claim that the portraits located in both Texas and at the Missouri Birthplace portrayed Samuel Clemens with short hair. The story failed to take into account the age of Clemens at the time Millet painted his portrait -- forty-one years old. Establishing provenance is essential in solving mysteries of disputed authenticity. In 1946 the 63rd General Assembly of the State of Missouri passed legislation to establish a memorial to Samuel Clemens within the State Capitol. The memorial would include a portrait of Clemens as well as the original manuscript of the English edition of The Adventures of Tom Sawyer. Funding for the purchase was finally provided in 1948 and when the 65th General Assembly convened a committee was established to make the purchase of the portrait and Tom Sawyer manuscript from book dealer Frank Glenn of Kansas City, Missouri. Placing the manuscript and portrait of Clemens in the Capitol building had been a long-range goal of Glenn's. While much attention was paid to the acquisition and authenticity of the Tom Sawyer manuscript, little question was given to the provenance of the portrait. Glenn's portrait was an oil on canvas featuring two inscriptions. "Samuel Langhorne Clemens" was written in black ink across the back of the canvas and the words "Recorded in biography of M. Twain by Albert Bigalow Payne" was penciled on the wooden frame. Whoever added that inscription had misspelled the name of Albert Bigelow Paine. Missouri legislative records dated January 14, 1950, indicate Frank Glenn charged the State of Missouri $5,000 for the Tom Sawyer manuscript ($35,000 in today's dollars) and $1,500 (now equivalent to $10,700) for the portrait identified as Samuel Clemens, painted around the time Clemens had written Tom Sawyer. Glenn also charged the State of Missouri for three years of insurance on the manuscript. He charged for six years and three months insurance on the portrait -- indicating the portrait may have been purchased at an earlier date, possibly as early as 1943. For over a decade the portrait and manuscript were housed in the State Capitol at Jefferson City, Missouri. In 1963, without noticeable provocation or fanfare, the General Assembly passed legislation removing the two items to the Mark Twain Shrine in the Mark Twain State Park near Florida, Missouri where they were to remain in custody of the Missouri State Park Board. The portrait arrived at the museum on May 27, 1964, and for another twenty years remained there without controversy although some visitors often remarked that the portrait really didn't look like Sam Clemens. The ear lobes were too long, the neck was too short, the hair had no widow's peak, the nose was wrong. 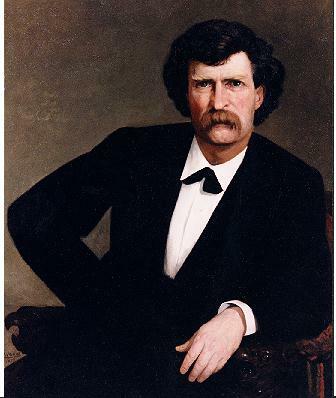 The man in the portrait was too old to have been Sam Clemens in 1876. In 1984, enter Goldena Howard, a native of Hannibal, Missouri. She was a writer, historian, and a contributor of feature stories for the St. Louis Post-Dispatch and Hannibal Courier Post. Howard's career included fourteen years as head librarian of the State Historical Society of Missouri where she was considered their resident Mark Twain expert. 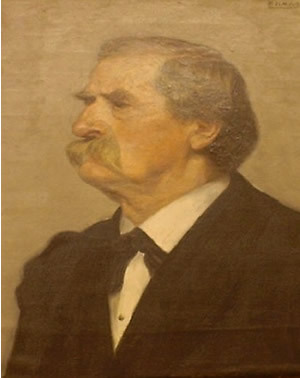 In a letter dated May 8, 1984, Howard informed Birthplace Site Administrator Stanley Fast that she was contacting Joyce Sharpey-Schafer, granddaughter of the artist Francis Millet and administrator of his estate, regarding the portrait of Samuel Clemens. Sharpey-Schafer, who possessed her grandfather's diaries, account books and papers, had just written a biography of her grandfather titled Soldier of Fortune. Although Sharpey-Shafer's book would not attempt to catalog or document all of Millet's portraits nor present a critical analysis of his ability as an artist, she had included a photo of the portrait of Samuel Clemens owned by the Hannibal Public Library in her book. She replied to Howard in a letter dated May 15, 1984. Based solely on description, Sharpey-Schafer indicated the portrait owned by the Birthplace was probably not painted by her grandfather who never signed his work in top right hand corners. Sharpey-Schafer added that in the past ten months alone she had discovered three definite fakes and a possible fourth. Firstly, it is NOT a work by my maternal grandfather, F. D. Millet, as any Art connoisseur will tell you. In view of the very prominent position your painting has, I shall be very glad if you will make every effort to trace the provenance of the work, and immediately remove it from the public gaze, as it is an inferior work and very damaging to the reputation of my grandfather as a fine American painter (3). It is an inferior work and the signature not my grandfather's" (4). ..Unless or until the portrait is judged to be a product of Millet's hand, it will not be put on display in the Museum (5). A few months later an unrelated newspaper article dated November 4, 1984, in the Jefferson City News and Tribune profiled Ardis Glenn and mentioned the State's purchase of the Millet portrait. Fast decided to again write Ardis Glenn requesting information without tipping his hand that the portrait was under a serious cloud of suspicion. Three months later, Ardis Glenn replied that no records relevant to the provenance of the portrait remained in her files. She further indicated her chagrin that the manuscript and portrait had not remained on display at the State Capitol and concluded her letter, "Frank would be most unhappy that it was moved, I'm sure" (6). Unknown to all concerned, an almost identical portrait was sitting 800 miles to the south in Austin, Texas. The Harry Ransom Humanities Research Center (HRC) at the University of Texas in Austin is ranked one of the top three cultural archives in the United States with holdings valued at $1 billion -- second only to the Library of Congress and New York Public Research Library. The vast accumulation of holdings -- over 40 million rare books and manuscripts and 100,000 works of art -- occurred primarily in the mid-1960s when Harry Ransom, Chancellor of the University of Texas from 1961-1971, engaged in a decade-long spending spree to purchase what critics called "instant ivy" for his institution. In the years 1958-1971, when Texas oil and Texas dollars flowed freely, over $2 million a year found its way into Ransom's budget. Ransom's uncontrolled spending, much of it in conjunction with controversial rare book dealer Lew David Feldman of New York, was surrounded by secrecy, questionable dealings, and inadequate record keeping. On June 23, 1961, the portrait signed "F. D. Millet" arrived in Austin. It would not be catalogued until September 14, 1966 -- over five years later. It was valued at $1,500 -- the same purchase price the State of Missouri had paid for their painting. Records obtained from the University of Texas in October 2002 under a Freedom of Information request indicate that in April 1961, Lew Feldman was putting together an art collection for sale to the University of Texas. Feldman informed Harry Ransom and HRC Director Warren Roberts that he wanted to add a Mark Twain portrait to the collection. Correspondence from the HRC office in June 1961, indicates that there was confusion in their offices about the purchase of the portrait but that payment was being processed accordingly. Nowhere throughout the surviving correspondence between Feldman and University officials was any question made concerning authenticity or provenance of the portrait. It appeared to be a smooth, last minute transaction based solely on the word of Feldman. The Library Chronicle of the University of Texas at Austin dated Spring 1974 featured a black and white photograph of the portrait identified as Mark Twain with the F. D. Millet signature along with a short article written by graduate student Lucien L. Agosta. It would be twelve years before a copy of Agosta's article reached officials in Missouri. In October 1986, John Cunning had taken the reins as Site Administrator for the Mark Twain Birthplace and took up the task of pursuing answers to the case of near-identical Millet portraits of Samuel Clemens. Both Harry Ransom and businessman Lew Feldman had died in 1976. An internal audit released three years after Ransom's death criticized the Center's lack of records and questionable dealings. In reply to an inquiry from Cunning, curator Kathleen Gee of the HRC stated the portrait was purchased from Lew Feldman of New York. She further wrote, "When Mr. Feldman died, his records disappeared. There was no provenance given for the painting" (7). A close comparison of a photograph and descriptions by Gee of the Texas portrait convinced Cunning there were differences in the F. D. Millet signature. Although the signatures were similar, they did not match. The Missouri portrait exhibited thicker areas of paint than did the Texas portrait. 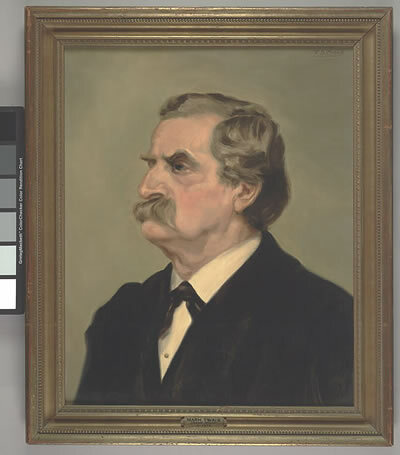 Gee also acknowledged the Millet portrait held by the Hannibal Public Library was indeed the most probable authentic Millet portrait of Samuel Clemens. With the brief exchange of letters between Cunning and Gee, the attempt to establish provenance had reached a dead end. Key players in the chain of ownership had died. No extensive scientific tests have ever been conducted. And today the two portraits continue to be stored out of site of public view -- a question of forgery or misidentification still unanswered. 1. Samuel Johnson Woolf, "Painting the Portrait of Mark Twain; The Humorist's Character as it Became Unfolded to the Artist," Collier's, vol. 45, no. 8, 1910, p. 43. 2. Autobiography of Mark Twain, Volume 3. Benjamin Griffin and Harriet Elinor Smith, eds. (University of California Press, 2015). 3. Letter of Joyce Sharpey-Schafer to The Curator, June 9, 1984 (on file at Mark Twain Birthplace Memorial Shrine). 4. Letter of Joyce Sharpey-Schafer to Stanley P. Fast, June 11, 1894 (on file at Mark Twain Birthplace Memorial Shrine). 5. Memorandum of Sam Wegner to Orval Henderson, August 17, 1984 (on file at Mark Twain Birthplace Memorial Shrine). 6. Letter of Ardis Glenn to Stanley Fast, February 5, 1985 (on file at Mark Twain Birthplace Memorial Shrine). 7. Letter of Kathleen Gee to John Cunning, October 23, 1986 (on file at Mark Twain Birthplace Memorial Shrine).